Its Friday! Which means it’s time once again for the weekly video round-up of my favorite pop culture atrocities, misfires and entertaining trainwrecks. This week’s theme: The Halloween Series! Rob Zombie‘s reboot sequel is hitting theaters today, so I thought I’d take a look back to the original series. 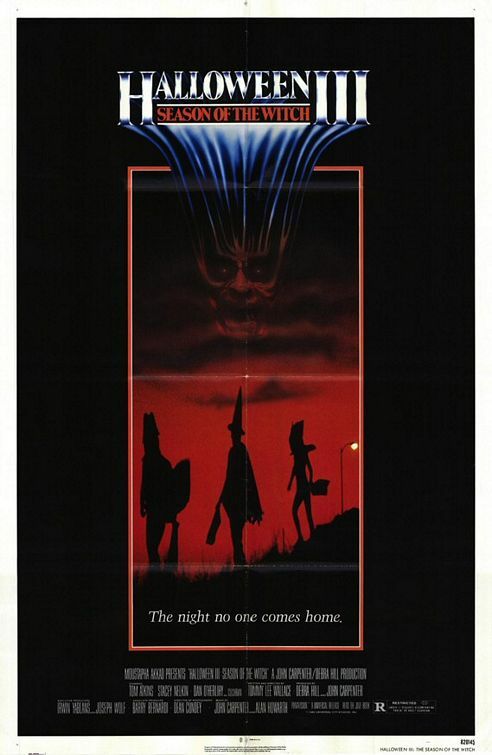 In 1978, John Carpenter wrote (along with Debra Hill), directed and composed the music for Halloween, starring a then-unknown Jamie Lee Curtis. According to IMDb, it was shot in 21 days on a teeny budget of $300,000 (cheap even for that time). 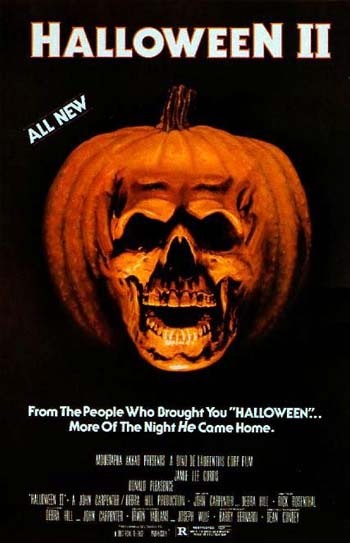 When Halloween opened on October 25, 1978, horror fans flocked to see it and critics were quick to notice its importance, especially in terms of what it would do for the genre. The film went on to gross over $45 million and has become a beloved classic, right up there with Psycho, and the “boogeyman” character of Michael Myers has become a cultural icon (he’s also known as “The Shape”). 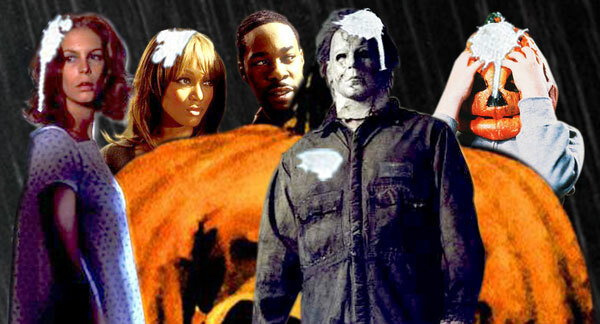 Halloween‘s sequels, however, are a horse of a different color. For those deplorable movies, the filmmakers threw out the originality, suspense, and artistry of the original and only kept the mask. And they couldn’t even get that right. The Halloween sequel that set the bar for how bad later entries could be is Halloween II: The Nightmare Isn’t Over. It takes place on the same night as the original. Surviving heroine Laurie Strode (Curtis, reprising her role, but phoning it in) is wheeled into the Haddonfield hospital where, for some inexplicable reason, she is often left alone and sedated. That, of course, means she’s fair game for the murderous Michael Myers to hunt her down. We later find out that he is her long lost brother– a revelation that’s not quite as compelling as the Darth Vader/Luke Skywalker connection in The Empire Strikes Back. Meanwhile, Dr. Sam Loomis (Donald Pleasence) is obsessively trying to chase Myers down (why he doesn’t just visit the hospital where Laurie is stationed right away, nobody knows). It’s hard to say why this one turned out so bad. The screenplay was written again by Carpenter and Hill. They did wonders three years prior. Perhaps it was because of first-time director Rick Rosenthal, who can’t seem to make sense out of the material anymore than the audience can. The badness could also be due to the gazillion terrible ripoffs that spawned in the wake of Halloween‘s success. Somewhere along the way, Carpenter fell victim to the monster that he created. To be fair, though, I did love Halloween II growing up. And it did terrify me (hey, I was 10). The music is intense and creepy, and there are some effective jumps. But now when I watch the scene where a naked nurse thinks she’s being cuddled by her boyfriend, when it’s actually Myers, and erotically tickles his lips… I just burst out laughing. Here’s a Halloween sequel where Michael Myers is nowhere to be found. Where’s the logic there? It’d be like making a 007 movie without including James Bond. Halloween III: Season of the Witch came about because, according to IMDb, Carpenter had this crazy idea to produce a Halloween-themed horror movie every year sans Myers– he was supposedly “killed off” in an exlposion during the finale of the last installment. Big Mistake. Also, this movie wasn’t helped by the fact that Carpenter neither directed nor wrote it. He gets a producer credit, but I doubt he had much to do with the project. At least I hope he didn’t. 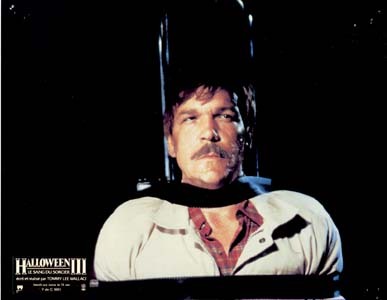 Halloween III, written and directed by Tommy Lee Wallace, was such a critical and commercial disaster that any future plans for sequels without Myers were scrapped immediately. The plot centers on a mad doctor who hatches an evil plan to sell “killer” Halloween masks to millions of children and then murder through the use of a mysterious TV wave while they’re wearing them.If that doesn’t make much sense to you, then don’t worry, you’re not alone. Halloween III is so cheapie and terribly executed that it’s a wonder it even made it to theaters. Tom Atkins, who plays Dr. Challis, the movie’s hero, looks like he was paid in beers for his performance. If he was, then maybe producers ought to have supplied audiences with beers as well. That way, they might’ve actually been able to sit through it. What can you say about this one? It makes Halloween II look like Citizen Kane. In this author’s humble opinion, it’s the absolute worst of the series. Not only is it not even remotely scary or thrilling, but it’s also appallingly lame. Halloween: Resurrection, also directed by Rosenthal, opens with a sad cameo by Curtis. 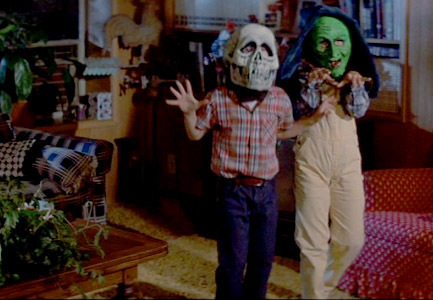 In the scene, iconic heroine Laurie Strode finally meets her fate by the hands of Michael Myers, whose mask looks cheaper than those ones they sell at target for $4.99. More than her pay, I bet Curtis agreed to this cameo so that she wouldn’t be obligated to appear in any more crappy Halloween sequels. I don’t blame her. From there, the movie kicks into motion, or rather, limps on pathetically. We are introduced to a couple of opportunistic producers (Busta Rhymes and Tyra Banks– yes, you’re reading the cast list right) who decide to film a reality show inside the old Myers house. They think big ratings will come of this. Naturally, the kids who participate in the show meet their bloody fates one by one, unaware of the fact that Myers has come back to Haddonfield. 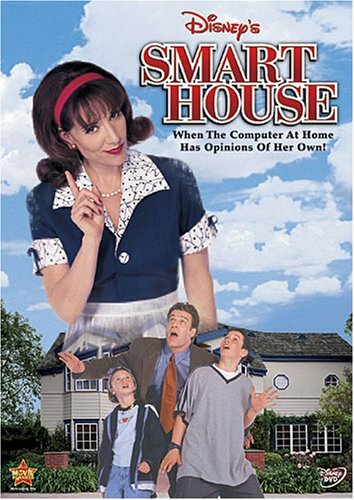 Then a nerd (Ryan Merriman, whom I recognized from the equally lame Disney Channel movie, Smart House) hacks into the TV show’s feed and aids the surviving few to safety using his laptop. Some plot, huh? Or lack thereof. After an hour of cutesy dialogue and juvenile antics, I thought that I was watching an ABC Family original movie. That would actually be preferable. 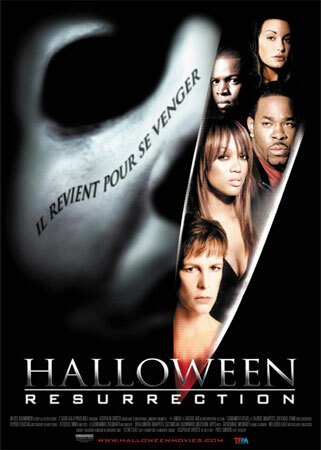 Halloween: Resurrection is the epitome of how far the series had fallen after seven entries. In the original Halloween, Laurie asks Dr. Loomis, “What’s the Boogeyman?” and he responds, “As a matter of fact, that was”, in reference to Michael Myers. In this movie, Busta Rhymes, in a hammy and over-the-top manner, jumps out at Myers and yells, “Trick or Treat, Mothafucka!” That, right there, says it all. This installment was so bad that they had to reboot the franchise as a result.